Well today's dig started off a bit unusual I had been very sick with some kind of flu bug and hade been just laying around most of the week. I had noticed a new construction site the week before but it wasn't ready to dig yet. So all week I had been thinking about this site since it was in an early part of Baltimore. Finally very early Saturday morning mostly due to not being able to sleep the night before from being sick still. I decided to take a drive downtown about 8:00 am to check out this sites progress. To my surprise they had the site down to dirt and all the debris cleaned up. I said this is ready to dig. So I called my friends Tom and Phil and as luck would have it they were both on there way to Baltimore to dig. I told them About the site and said I was going to run back home and change my clothes and put on stuff I can dig in. About 45 minutes later I returned to find Tom, and Phil probing and digging a test pit. Tom was digging in what I thought was a small building foundation. 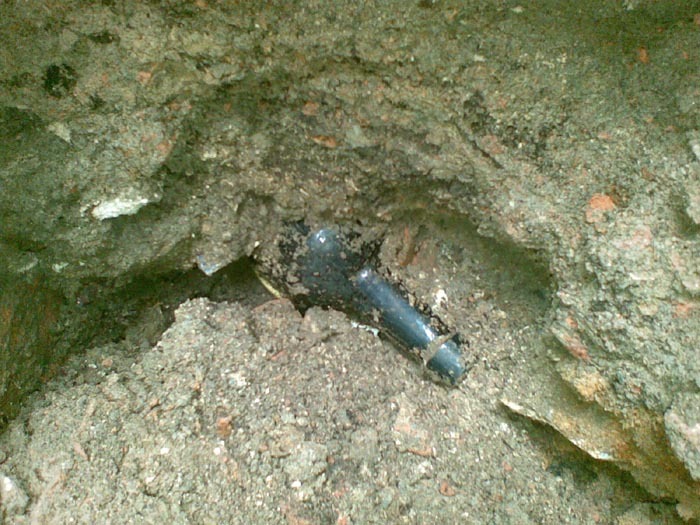 But turned out to be a very shallow 3 foot wide by 8 feet long by 3 feet deep brick lined trench privy. This pit only had about 6 inches of layer in the bottom but produces some great finds. 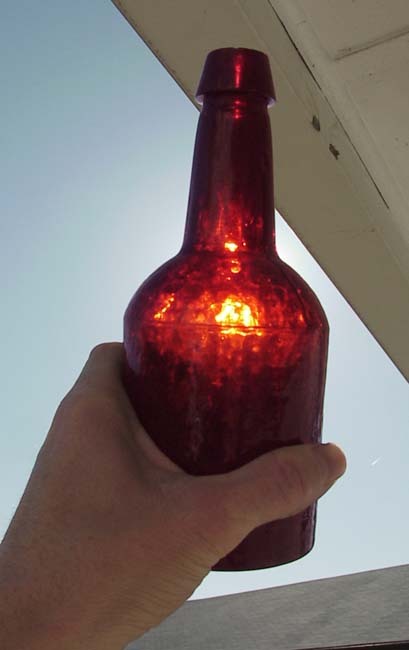 Including a Green Gardner and Brown Torpedo soda from Baltimore and a Puce iron pontiled 3 piece mold porter blown at a Baltimore glass house in the mid 1840s. a few puffs and an almost intact yelloware chamber pot. While Tom was finishing up the shallow trench privy me and Phil were probing around looking for another pit to dig. We both found one area that probed ash at about 2 feet but it seemed too big to be a privy. So we started digging a test hole we got a few 1870s shards out of the ash but could not locate a wall to this feature. I started digging a trench towards the road after about 6 foot of trenching I exposed a brick wall. I started following it around and it was curving like a very large bricklined privy. IT was decided that we all would concentrate on this large pit. after a couple hours of digging we had about a 3rd of the pit opened up and down about 4 feet then we started taking half that down another 4 feet where we finally hit a trash layer coming up the edge. This slayer was heavily laden with artifacts from the 1820s and earlier. 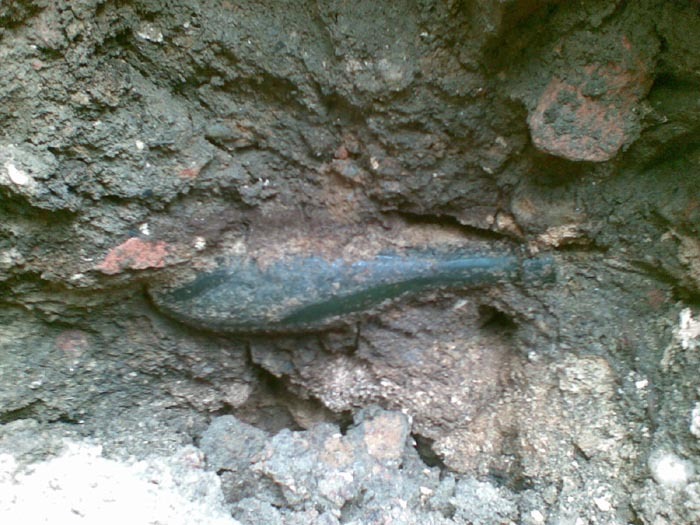 We got a small test hole into the layer and recovered an early pontiled blackglass bottle and a redware jar along with a few very early pontiled puffs. We were going to go get the tripod and set it up then a disgruntled neighbor came out and was up set because we were digging close to his wall And said if we didn't leave he was going to call the cops. So we packed up and left. and decided that we would get permission from the contractor and finish digging the pit.